Book Posts - That Blue Sky Feeling: Volume 1 — Comic Art Ed! Book recommendations for young readers, educators + caregivers! Age Recommendation: Teen. Contains suggestive themes + slurs. Intro: Noshiro and Sanada are your typical high school students, except there are rumors that Sanada might be gay. 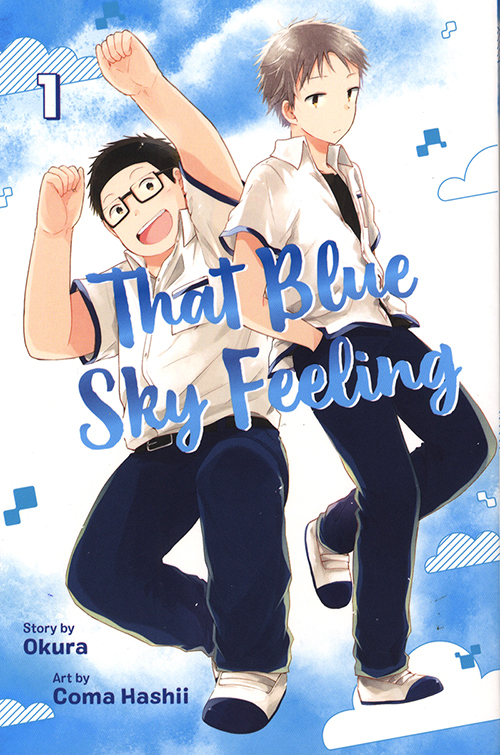 That Blue Sky Feeling is a slice-of-life comic with a wonderful and sensitive depiction of the insecurities teenagers can feel about sexual orientation. Story Summary: Noshiro is a nice guy who is starting a new high school in 11th grade. He works hard to make friends, and gets curious about Sanada, the class loner. Sanada is quiet and standoffish, and Noshiro quickly learns that there are rumors in school that Sanada might be gay. Sanada's only friend is his female childhood friend Yamamoto. Noshiro decides he wants to become friends with Sanada, and help him overcome this rumor with everyone at school! Sanada isn't sure how to take this. He confesses to Noshiro that he is, in fact, gay. Noshiro is confused and grapples with new feelings, and decides to work harder than ever to learn more and become even better friends with Sanada. Theme 1: Being gay, in public and private. What does it mean to be gay in public, versus being gay in private? Because of the rumor about Sanada, other kids leave him alone, and he leaves them alone. But Sanada comes out to Noshiro, and Noshiro has to grapple with the truth, and the secretive nature of that truth. That Blue Sky Feeling is a sensitive depiction of this difficult time of a child's life, and how sexual orientation can play a part in a teenager's social life. Theme 2: Understanding + Acceptance. Noshiro learns that Sanada is gay, but Sanada continues to hold back. There are still emotional hurdles to overcome in their friendship, and Noshiro also begins to learn more about himself as a result. Throughout That Blue Sky Feeling characters are slowly learning and changing. Theme 3: Friendship + Growing Up. Friendships can change when a person grows up. The friends you make in elementary school, versus middle school, versus high school, can be very different. That Blue Sky Feeling explores how maturing can change people, and change those relationships to other people. Should I Read It? : That Blue Sky Feeling is a wonderful book for anyone interested in the subtitles of being a teenager of any sexual orientation, getting along and understanding one another.